On the road of life there are those who require the help of others for brief periods. It is a journey of giving your time, your talents, going the extra mile with them; it is a journey allowing a sinner to know he is forgiven. It is a journey that gives people who pray the faith that God will do what he promises to do. It is a journey allowing others to know there are those whose dedication goes far beyond words or deeds. It is the journey that accompanied Jesus Christ from the life of a carpenter to his death as our Savior on a cross. The journey is called dependability. 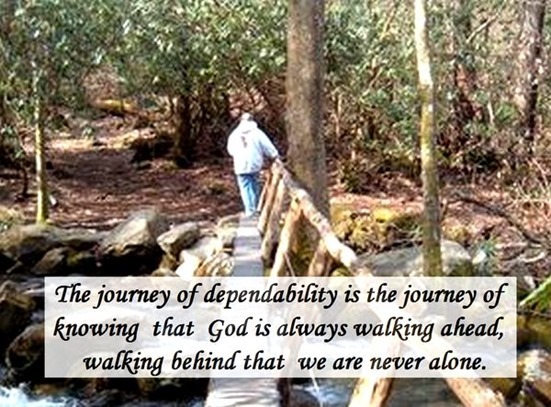 The journey of dependability is the journey of knowing that God is always walking ahead, walking behind that we are never alone. It is the journey of knowing that when there is a need those whom we call friends will walk physically and spiritually beside us wherever life leads, or even carry us when the need arises. It is the journey of a Pastor who leaves the fold to seek those who have wandered away or who are pulled away by the circumstances of life and need special attention. It is the journey of parent who never turns away their children no matter what. It is the journey of the Holy Spirit as it ministers to all people. The journey of dependability is not an easy one, it is a journey that starts as a small seed, a seed of love, a seed of dedication, a seed of time and sacrifice. As the seeds are planted into soil of someone else’s life they must be cultivated with great love, with a great deal of patience, they must be nurtured with closeness, fertilized with physical and spiritual resources. And slowly ever so slowly as the roots of dependability grow deep into life a tender shoot breaks forth and uproots an untrustworthy life. The journey of dependability is a narrow winding road climbing mountains of doubt, down into valleys of despair, through deserts of isolation and loneliness, through dark tunnels of sin, and everywhere else life leads. It is a journey that is often begun with good intentions, but good intentions can not replace genuine love. Love such as the love of Jesus when he touched and healed the wounds of those the world had cast off. Love such as the love of Jesus as he took time to visit a woman grieving over the death of a brother. “What ever you do or do not do to your fellow human’s you have done it to me,” words of Jesus that echo across time words that will stand with you on the day when you will be judged by God.